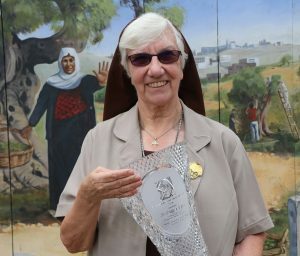 A Sligo woman serving in Jerusalem with the Franciscan Missionaries of Divine Motherhood (FMDM), has been awarded Trócaire’s inaugural Romero International Award. The award, instituted by the Irish Catholic Church’s overseas aid agency, commemorates the inspiring work of justice and peace campaigner Blessed Oscar Romero, who was assassinated while celebrating Mass as Archbishop of San Salvador in 1980. It also honours those working today to raise awareness about human rights violations and/or to help those who are experiencing poverty and injustice. The inaugural award was presented on Saturday to Sr Bridget Tighe, of Caritas Jerusalem, at the Franciscan Convent in Ballinasloe, Co Galway. Sr Bridget, originally from Ballindoon, has served almost 40 years in the Middle East. For 25 years she worked with Palestinian refugees in Jordan, but more recently she has been serving the beleaguered Palestinian communities in Gaza and Jerusalem. For a while she was head of a Caritas Jerusalem medical centre for Gaza, where the population has suffered from repeated attacks by the Israeli military. She is currently the general director of Caritas Jerusalem. “It’s a great honour, receiving this award from Ireland and from Trócaire,” said Sr Bridget. “I couldn’t think of anything better, because most of my adult life and professional life has been spent outside of my home country, and for Ireland to recognise my work abroad is truly a great honour. “I see this Trócaire award as recognition and support of what I have done, but it is also for my own family and my religious family. I could not have achieved this without their support, for which I’m grateful. My family have supported me from childhood onwards and my religious community, my sisters, have been behind me throughout all of the different kind of work I have done. Trócaire Executive Director Éamonn Meehan said the charity was delighted to honour Sr Bridget. “Throughout her long and distinguished career she has dedicated herself to the service of the poor and the vulnerable,” he said. “In Jordan, in Gaza and today in Jerusalem, she offers care and support to Palestinian communities who continue to suffer great injustices. Around the world Trócaire partnerss with more than 400 local organisations, which work tirelessly, and often at great personal risk, to support communities facing threats. Each year from now onwards, the Trócaire Romero International Award will recognise the outstanding work carried out by one of these partner organisations.